$10,000 when using this bonus. Having opened its doors in 2015, BetChan Casino is a great place for Australian players to come and enjoy their online gambling experience. 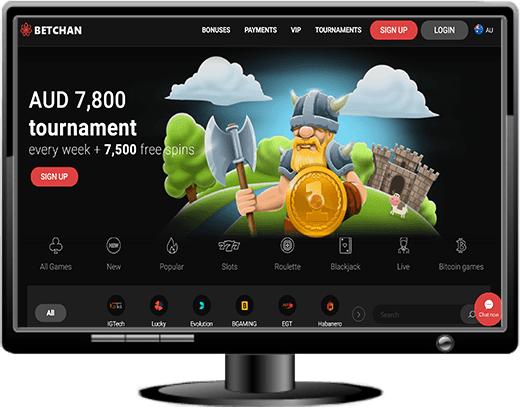 Not wanting to be outdone by any other online casino, BetChan offers the widest variety of payment options that we’ve ever seen, including multiple cryptocurrency payment options. The casino offers licences from multiple software providers meaning that you’ll be able to experience a vast amount of slots and table games from any and all walks of life. The site also offers a number of promo codes and bonus promotions that will give players a fair amount of added perks when signing up. The reason that BetChan is able to offer such a wide variety of slot and table games to its users is because the site has partnerships with many of the different software providers. You’ll be able to play games from providers such as NetEnt, Betsoft, Amaya, iGaming2Go, Evolution Gaming, NextGen, Pragmatic player and many, many more. As a result of this, you’ll find a total selection of over 2,000 online games. When you first jump onto the site, you’ll see the games organised by type and then by provider. If you’re in the market to find one specific slot and you know who makes it, you’ll be able to find it relatively easily on the site. You can search by All, New or Popular, or if you’re in the mood for something specific, you can search by Slots, Roulette, Blackjack, Live and Bitcoin Games. Each of the different categories has a bunch of variety in the game. For example, if you head into Roulette, you’ll find American Roulette, European Roulette, Lightning Roulette, Speed Roulette, Live Roulette and many, many more. There are also Bitcoin exclusive games on offer and almost every game has a demo mode where you can try it for fun and see what the game is like. The one thing that we’d like to see added to the site is an option progressive jackpot games faster. If you’re in the market for online gaming on your mobile then have no fear because BetChan Casino offers a fully mobile responsive lobby that players will be able to enjoy no matter their device. We’ve been able to test the site using a number of different devices across operating system and brand and didn’t find any issues when trying to play. Most of the titles that you see on the fully-fledged desktop site will also be available on mobile through your mobile browser. If you’re running an iPhone or an Android smartphone, you’ll still be able to experience the best of the best. Online games when played on mobile, especially those that are known as instant play games, will be a little less flashy and resource-intensive when running on mobile. This is purely due to the fact that the games themselves will be able to run faster, save you data and save you memory on your smartphone or mobile device. There’s little need to have apps these days and although some casinos and sites do offer them, when sites are fully mobile responsive and cater towards users with mobile, like BetChan, there’s very little need for such an app. You’ll get access to 16 different progressive slots at BetChan Casino. You can get rich quick by earning tens of thousands of dollars with BetChan just by getting in a few lucky spins. You’ll be able to try games like Super Multitimes Progressive, Joker Poker Progressive, and other games like Tens or Better, European Roulette and Platoon Wild. At BetChan Casino, you’ll get a free 100% matched deposit on $100 as well as 30 free spins. You’ll get a number of different bonuses upon joining too, because you’ll get a further 50% on your second deposit with 30 free spins, another 50% on your third with 30 free spins and 50% on your fourth with 30 free spins. All you’ll need to do is put in the BetChan Casino bonus codes to claim your free money and spins. BetChan Casino offers some great customer service round the clock with their 24/7 live chat support. You can also contact them through email for matters that may not be able to be handled through live chat. Unfortunately, you won’t be able to phone in and get a direct answer straight away. We also weren’t able to find a comprehensive FAQ for the site that answers the most common questions. BetChan offers one of the most comprehensive lists of deposit and withdrawal methods that our review team has seen. You’ll be able to use major debit and credit cards such as VISA and Mastercard, but will also be given the option to use a huge amount of ewallet providers. You can try Skrill, Interac, Paysafecard, ecoPayz and Neteller. As far as other transfers are concerned, you can get Rapid Transfer payments, Wire Transfer payments through soFort and cryptocurrency payments too. When we talk about crypto payments, we’re not only talking about Bitcoin, but cryptocurrencies like Ethereum, Bitcoin Cash, Doge Coin and Lite Coin too. A far as withdrawals go, you’ll find it tough to deposit into your debit account, but Betchan does allow withdrawals into credit cards You’ll also be met with a similar amount of ewallets and crypto withdrawals that you’ll be able to use. For most ewallets and cryptocurrencies, you’ll find that withdrawal speed is almost instant on many occasions. The difference is the transaction limit because you’ll be limited to a minimum of $20 on most withdrawals. With crypto, you can go down to quite a low amount depending on the exchange. Most bank transfers will take between 3 and 7 days as is the standard. Sometimes it’s faster, sometimes it’s a little longer, but you can rest assured in knowing that it will be safe and secure whenever it happens. What’s there to complain about with BetChan? From the moment you set foot into the BetChan Casino lobby, you’ll be met with a bunch of games that are free to play but also except AUD. There are thousands of different games to play, from progressive slots to table games to bingo and you know that you’ll also be able to find the right game for you. The payment methods are so diverse and offer options to every player that wants to start playing at BetChan. Our review team found the mobile site was responsive and just as easy to use as the desktop site so it’s a winner all round.